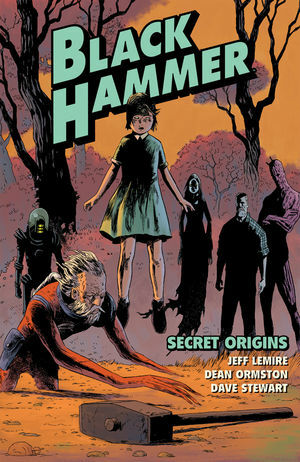 Black Hammer: Secret Origins is a superhero team book about a group of characters that are neither a team or really superheroes. Jeff Lemire and Dean Ormston’s cast of characters, seemingly exiled from their own universe ten years ago and trapped since then in a small, rural American town, struggle with what their lives have become. They were superheroes, adventurers, mystics but, most importantly, they were outcasts in their own world. One was a woman who only has super powers when she transforms into a young girl. Another was an alien from a warlike planet, sent to Earth to display to him his own weakness. A weakling turned hero, a space explorer finding the truth about the universe, and a woman cursed to experience and cause horrors; they were heroes and adventurers who were from the world of our comics. And to save their world, they sacrificed their lives for it and became trapped in a world where there are no heroes; there are only the small town and their farm. These beings who saw wonders and miracles have spent the last 10 years housekeeping, farming and trying to act normal. Jeff Lemire is no stranger to small towns. His breakout trilogy Essex County (which I've written about here and here) covers a lot of the same rural landscape but hockey players have been replaced with superheroes. On their world, they had names like Golden Gail, Barbalien, and Colonel Weird but in their home for the past 10 years, they’re just Gail, Mark, and Randall. Lemire and Ormston straddle the line of telling stories about superheroes and telling the story about people who are tired and disappointed with what their lives have become. This is a story about 6 people who once may have been the closest thing to gods in their world but now they find themselves isolated and reclusive as they’re trapped within the boundaries of a small, country town with just other lonely people surrounding them. 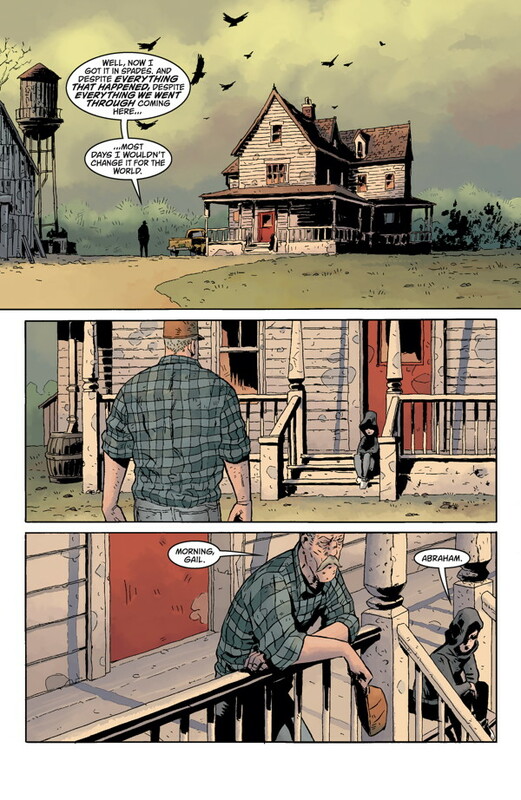 In the superhero moments consisting of flashbacks showing these men and women in the prime of their lives, Ormston’s art and Lemire’s writing pay loving tribute to the history of the genre, the variety of stories that exist in it, and even the creators who have created these great stories. There’s a taste of everything from Adam Strange-like sci-fi to the horror stories that Len Wein and Bernie Wrightson worked on together. This genre mash creates a rich cast of outcasts. Ormston and colorist Dave Stewart move between the past and present, between adventure, horror and science fiction without ever really acknowledging the tonal shifts, except for maybe a bit of Jack Kirby or Murphy Anderson thrown in now and again to set the scene. In that way, Ormston doesn’t allow the reader to react to the changes because stylistically there’s not a great changeup. This isn’t a collection of genre tributes or pastiches; Lemire and Ormstron are using these different genres and stories to create a single story. As they try to blend into the local town, they’ve adopted the guise of a multiple-generation family and that’s what they have become. It’s been 10 years since they saved their world and became trapped in this town and while they may all want to deny it, Lemire’s writing shows just how they’ve become a family over that time, arguing and bickering with the best of them but also there for each other when they really need this thrown-together band. The dysfunctional family is a bit of a cliche but Lemire makes it work here for him and Ormston because the focus isn’t on the dysfunction but on the cost of it. 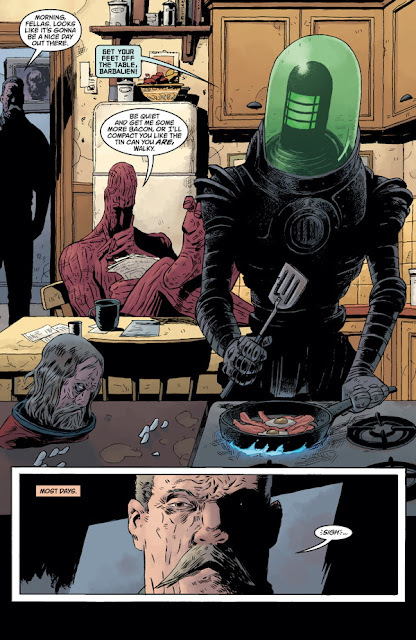 This blending of the fantastic and the rural creates the fascinating tensions of Black Hammer: Secret Origins. The images that Ormston gets to draw, from the multiple facets of the multiverse to a diner where the locals gather after a day of honest work, show the various periods of these characters’ lives and it’s hard to see why they long for the past. Lemire and Ormston’s past for these characters isn’t all sunshine and roses so they’ve sacrificed one life for another; it’s not better or worse, just different.